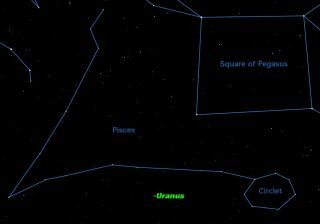 The planet Uranus is currently located in the dim constellation of Pisces. Although just visible with the unaided eye, Uranus is brighter than any of the stars in this area, so is relatively easy to locate with binoculars. Most of the planets in the solar system hover close to the sun, which makes them among the brightest objects in the sky. The outer planets, Uranus and Neptune, are far from the sun and catch few of its rays, making them dim and hard to find. Uranus, for example, reaches opposition with the sun on Thursday (Oct. 3). Directly opposite the sun in our sky, it is at its closest and brightest, yet it is only just barely visible to the unaided eye in a dark moonless sky. For most people, a set of binoculars will be an essential tool for spotting Uranus. If you aren't able to catch sight of Uranus at opposition this week, you can tune in to the online Slooh Space Camera on Thursday at 9:30 p.m. EDT (0130 Oct. 4 GMT) to see their live broadcast of the celestial event. You can watch the Uranus webcast live on SPACE.com courtesy of Slooh. Many people who go looking for the Square of Pegasus miss it because it is so large. The four sides of the square are roughly 15 degrees long, about the length of the handle of the Big Dipper. Look for them in the east as the sky gets dark around 9 p.m. local time. At that time, the square is rising, so is tilted over, making it diamond shaped. Now we begin our "starhop." If you're in the Northern Hemisphere, we start with the two stars that form the bottom of the square. Make that one side of a south-pointing equilateral triangle. The southern point of the triangle marks the "Circlet," part of the dim constellation of Pisces. This is an oval of dim stars, more easily seen in binoculars than with the unaided eye. This article was provided to SPACE.com by Starry Night Education, the leader in space science curriculum solutions. Follow Starry Night on Twitter @StarryNightEdu. Follow SPACE.com @Spacedotcom, Facebook and Google+. Original article on SPACE.com.